The Rt Rev. 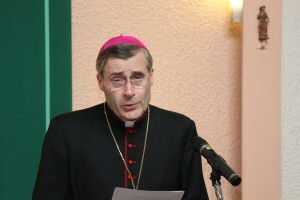 Mark Davies, the Roman Catholic Bishop of Shrewsbury, will today lead prayers in Hattersley, Cheshire, for Fiona Bone and Nicola Hughes, the Greater Manchester Police officers who were murdered as they answered an emergency call in the area on the morning of Tuesday September 18. Bishop Davies will tell local Catholics that the double murders serve as a reminder that the service of the police stands as “our last line of defence against the savagery of the jungle”. But Bishop Davies will also encourage the congregation by proclaiming the Christian teaching that “evil will not in the end prevail” and that “all that is good will have the final and definitive word” because of the “victory of the Cross” of Jesus Christ. “In this faith which speaks of hope overcoming despair, of light in the midst of darkness, of eternal life in the face of cruel death we pray for these two police officers who sought to bring peace and protection to this community. May they rest forever in peace,” Bishop Davies will say. The words of Bishop Davies will come during a homily at an 11am Mass at the Church of St James the Great, Underwood Road, Hattersley, during a pastoral visit to Catholics in the area. The Hattersley parish falls within the Diocese of Shrewsbury, which covers most of Cheshire as well as all of Shropshire and Wirral. Bishop Davies will say: “Today, with so many across the world we remember and hold in our prayer these two police officers together with their families and loved ones and the many colleagues who deeply mourn their loss. We feel a sense of sorrow and outrage too. We recall how what is good in the dedicated service of the community met, on our own streets, with what is evil in the hate and violence which did not hesitate to indiscriminately kill. “The sound of gunfire and a grenade exploding in the streets of this parish, the death of two young women fulfilling their duty, tragically reminds us that the police service stands as our last line of defence against the savagery of the jungle. If our children are not to grow up accepting the murders of Tuesday as commonplace then the police and the community must stand as one in defence of human life, overcoming whatever obstacles may prevent this trust.